Whenever you buy anything in a high street store you can almost guarantee that when you reach the checkout you will be asked if you would like to save a percentage on your purchases that day by opening a store card. Lots of high street and department stores have their own store or credit card. Some cover whole retail groups and others individual stores. They will probably have extra benefits such as being to pre-order from sales and getting special discount rates for those who hold a store card only. Because you are put on the spot when they ask you if you'd like to save money, it is a tactic designed to get you to make a quick decision without knowing the full facts of the arrangement. 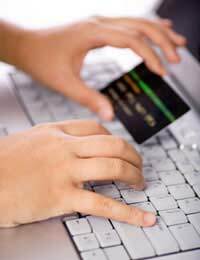 You should be never agree to sign up to any kind of finance without doing your research first and store cards are a type of credit card. If you are a regular user of that particular store and are interested in the card, ask if you can take information away with you and go back another time - or ask for your purchases to be put to one side while you read the literature on the card. If they seem reluctant to do so, it's probably because they know you won't want to sign up when you know all the facts. Is it Worth Getting a Store Card for the Discount? It can seem like a tempting proposition, especially if you are buying up a new wardrobe, in which case 10% or 20% or whatever the opening offer rate can really add up. What Will They Ask Me For? When you sign up to a store card you will usually fill out a short application form in the store, and you'll be asked to provide identification - more often than not a credit or debit card will be accepted for this. Once you sign up, the store will normally do a credit check while you wait, and providing that all is ok, you'll be able to have the offer rate taken off your final bill, and you'll be advised that the card will be sent to you in the post. It's all over so quickly that you probably won't have had time to read through the terms and conditions, never mind finding out what the APR is. It's estimated that around 50% of people taking out some form of credit don't even read the basic T&C's, so it's no wonder that they don't know what they are signing up for. Are They Cheaper Than Normal Credit Cards? No. In fact store cards are usually a far more expensive way to borrow money than credit cards are – there are some store cards out there have double the average APR of a credit card. If this is the case then you would be far better shopping around for a normal credit card. Why does having a high APR matter if I can just make the minimum payment? The APR or annual percentage rate is used to calculate your monthly interest payments. If you have a high APR, then it’s likely that if you only pay the minimum payment, you may not even pay enough to cover your interest rate that month. For example, if you have a minimum payment of £10 and you have a high percentage rate, then you may find that your interest payment is £13, so despite paying £10 off your balance monthly you actually end up owing your card provider £3 extra per month – so your bill goes up, not down! Can’t I Just Get the Card Then Cancel it? Lots of salespeople will advise you to do this in order to get the discount – but it only works if you have a strong resolve and are sure that you won’t use the card again. The only real way to ‘win’ when taking out a store card, is to take out the card when you are buying a lot of stuff in one go. This means that you get your discount and can still pay the balance off in full before your first bill comes in – then you can either close the account or just use it to get further discounts. If you close the account, remember that you’ll still have a credit search against your name and address for 12 months, which can affect your chances of getting further credit. If you decide to keep the account open and utilise the benefits of being a cardholder, make sure you aren’t tempted to spend more than you can afford to pay back in one go – or you’ll find that your discounts can end up being very expensive indeed! Is Your Current Account Safe?